It's not hard to prepare this delicious imperial dish at home. This is an exquisite cold appetizer that even Russian tsars could not do without. 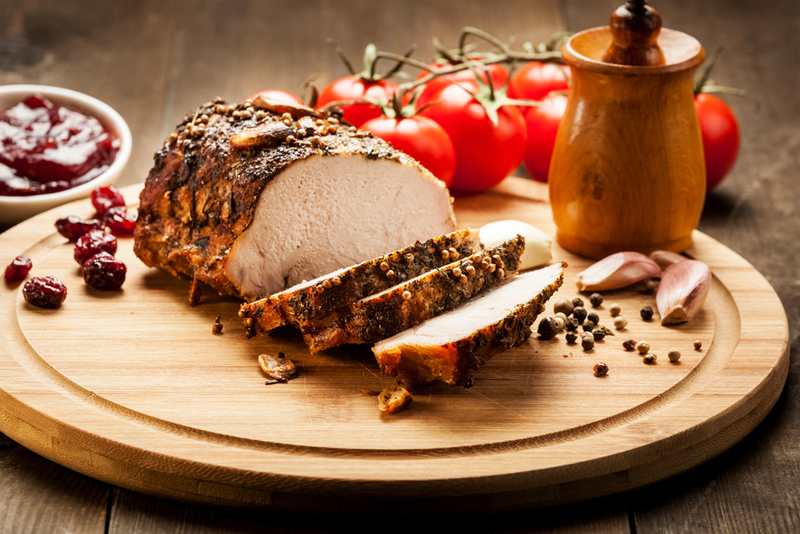 Today this roasted pork dish can easily be prepared at home. The most important ingredients are quality meat, fragrant spices and a good mood. "Order them to serve buzhenina… As much buzhenina as possible! The greasiest kind! I am certain that even if the duchess can resist you, she will never resist buzhenina. This is her favorite dish…"
Even one of her court jesters was given the surname of Buzheninova, in honor of this appetizer. Buzhenina is one of the most popular Russian and Eastern European dishes. Practically no celebration proceeds without it, since the appetizer is served both with vodka and wine. They say that "buzhenina" derives from the word "vuzhenina." "Vuzhit" means to smoke or to jerk. With time the "v" turned into a "b" and the meat, after being smoked, came to be known as buzhenina. According to another theory, the word comes from the name of an Eastern Slavic tribe "buzhane" that lived in the upper Bug River, which flows through Ukraine, Poland and Belarus. Due to the abundance of boars, smoked pork was the most common food in this area. The Germans and Austrians, who are big lovers of pork, have their own equivalent — Schweinsbraten. And let’s not forget that the English make roast beef, which is simply a large smoked piece of beef. The meat for buzhenina must be lean with a low quantity of fat. In ancient Russia this dish was made from bear meat, but then with the advent of pig farming Russians began to use pork. However, beef or even turkey can be used. Ideally it should be boneless leg, neck or fillet. Bones contain subtle layers of fat that will not let the meat dry properly. The leaner the meat, the better it will marinate and roast. There are two traditional ways to prepare buzhenina. If prepared in the oven it is juicier and has a smokier flavor. When boiled it comes out more delicate. Buzhenina should be boiled in cheesecloth so that the marinade does not escape into the broth. If boiled the cooking time will increase by about 1.5 times. In any case, both methods produce suitable results for people watching their weight. One hundred grams of buzhenina made from pork fillet contains only 250 calories. 1. To prepare the marinade mix the spices, garlic cloves (mashed or thinly cut) and olive oil together. 2. Rinse off the meat and allow it to dry. Then place it on aluminum foil and cover it with the marinade. Wrap it with two layers of foil and refrigerate for at least three hours; overnight is even better. The secret to good buzhenina is that the meat must marinate for a substantial amount of time. 3. Heat the oven to 180°C. Choose the cooking time depending on the thickness of the meat. For example, a fillet should roast for an hour, while a leg or neck should cook for 1.5 hours. 4. Place the cooked dish in a spot to cool off (on a balcony or windowsill, but not in the refrigerator) for at least 30 minutes. Once it has cooled off buzhenina is sliced and served as an appetizer or main course with traditional spicy Russian condiments such as mustard, horseradish or fragrant herbal vinegar.